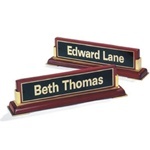 Engravables Plus offers personalized awards for one special person or for recognizing many folks. We have engraved gifts for retirees, the local PTA, theater groups, charities and more. To reward someone for years of service the Book Clock Award makes a very nice presentation that the recipient will display with pride. 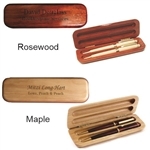 If you need smaller engravable gifts or awards consider the engraved pens and pen boxes or pencils and pencil boxes. Many organizations have our paper weights personalized as engraved appreciation gifts. Who's a star? EVERYONE!! 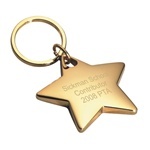 Personalized Gold Star Key Chain engraved for groomsmen gifts, birthday gifts, for students from preschool to college grads, and for employees awards and recognition! Gift Boxed. YOU'RE a star! 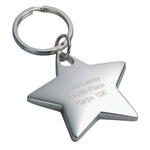 Nickel-plated Personalized Star Key Chain engraved for awards and recognition for teams, companies, graduates, gifts for wedding attendants and more! Our Most Popular key chain. Gift Boxed. Petite 2 mirror compact, shaped like a handbag. Personalize with an engraved name, date or anything you wish. Velveteen pouch. Bridal party, sisters, red hat ladies, shoppers, purse lovers, teens. A nice gift for your favorite hunter Our Personalized Hunting Knife features a Rosewood handle, locking three inch blade when open and a beautiful decorative handle with filigree detailing at both ends. Stainless steel parts & handles. The rosewood can be engraved with one or two lines of dark brown text. Knife measures 4-1/2" x 1-1/2" x 1/2" folded. Heart-shaped bookmark is a favorite. Engraved keepsake. Personalized heart is nickel-plated. Great Valentine gift. For book lovers of all kinds, all readers, and doctors, nurses, teachers, favorite students, etc. Gift boxed. Who's a STAR? Engravable mirror-finish nickel-plated star paper weight. Non-mar felt base. Personalize for employee recognition, student achievement award, team member, friend, boss, actor and actress, and yourself! Personalized non-tarnish silver rectangular box with dark blue velvet lining. This pretty box measures 4 in. x 5 1/4 in. Personalized silver-plated rectangular box with velvet lining. This engraved silver box is non-tarnish and measures 2-3/4 in. x 5 in. This rectangular glass vase has flat sides to hold your personalized monogram, logo or message. The heavy vase is 8 inches high, 4 inches across by 3 inches deep at the top. Personalize with just one initial, a clip art heart or fleur de lis, or a special date or message. Who's a STAR? Engraved Brass-plated star paperweight. Heavy. For any star! Actor, Stage Hand, Performer, Achiever, Student, Hard Worker, Speaker, Employee Reward. 4" x 4" tip to tip. A super gift for a superstar. Our engraved crystal star has clean, crisp lines that will shine crystal clear. 4" high x 5" wide tip to tip, and 3/4" thick. Comes packaged beautifully and ready to give in our two-piece blue gift box. The perfect gift for a special man. These silver oval cuff links can be monogrammed with 1, 2, or 3 initials in your choice of fonts. The cuff links add elegant touch to his outfit for a wedding, whether it's for the groomsman, best man, groom or father of the bride or groom. This is a nice gift for the guy who has everything, if he's a sharp dresser and likes French cuffs. Store your keepsakes with style! Ebony finish. Hinged lid. Personalized with sentiments, lyrics, poem, Bible verse, name, dates. Fit for a Queen. Larger non-tarnishing nickel-plated jewelry box. Engraved hinged top. Navy velvet lining. May be personalized for Anniversary, bridesmaids, Christmas keepsake, Birthday. This warm rosewood stained, piano-finished wood with gold metal accents is a classic. The large black brass engraving plate will accommodate the largest name and title. It's time. Distinctive gift. Rosewood-stained book-style hinged wooden case Beautiful golden clock and Engraved black brass plate with gold lettering. Give to parents, boss, employee, coach, sponsor, board member, etc. It's time. Beautiful golden clock in a rosewood-stained book-style hinged wooden case. Black brass plate engraved with gold lettering. Recognition award of distinction for employee, boss, board member, graduate, etc. This rosewood piano-finish plaque has a beautiful shiny wood. The plate has a gold florentine border with a textured black center and can be personalized with the text of your choice, including logos. This modern looking glass clock has a brushed aluminum panel and a white dial. This is a great option for awards, corporate gifts, coach's gift, etc. This is a classic and classy gift or award. Perfect retirement gift or thank you gift for a coach.The silver frame surrounds your black engraved plate on the left and a clock with a white face on the right. Open it and display the clock on a desk or shelf. Item #TPBC89 GREAT quality engraved solid maple or solid rosewood Double Box for pen or pencil box. Two grooves inside for implements. (Pens sold separately.) Up to three lines of engraving. Solid wood Penbox with groove slot for one pen. 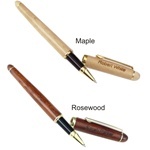 Rosewood (dark) or maple (light). You might choose one of our pens (sold separately) with a ballpoint or rollerball tip and have that engraved too! Ballpoint Pen. Sophisticated look and feel. Both from real wood: maple or rosewood. Twist the top and the ballpoint retracts smoothly. Comes in a narrow velveteen slip-case. 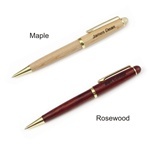 Made of real rosewood or maple, these Rollerball Pens offer a sophisticated look for any business employee or student and are great personalized. Made from quality woods. Laser produces dark lettering. Elegant gifts for students, executives, groomsmen, etc. Real maple or rosewood. Engraved Mechanical Pencil has twist top. Laser engraving is dark. Comes in a narrow velveteen slip-case. GET ORGANIZED! Nickel-plated letter opener is non-tarnishing. Elegant beveled blade. Can be engraved on the front and back. Great for individuals or for organizations needing recognition awards and thank-you gifts. Look, bud. Simple, clear, engravable straight bud vase. Personalized with names or monogram, wedding date, memorial date, or message. Available in Clear only. Clear engravable large straight vase. Can be used for flowers or votive candle. Personalized with names or monogram, wedding date, memorial date, or message. Readers! Shepherd's crook personalized gold-plated bookmark. Flattened stem is gentle to pages. Engravable circle disk tells everyone it's yours. 1" engraving area. Boxed. Take a mulligan! Super personalized gift! All 24K gold-plated brass golf set. Three tees, with divot tool, and 2 pop-off ball markers. Engraved with initials or monogram or short inscripition. Non-tarnish, mirror-finished nickel-plated engravable alarm clock. Great as a personalized award for any student or graduate, colleague, friend, relative. Glass Ruler 12" or 6"
CLEAR Glass Rulers. Solid 1/4" thick high-quality jade beveled glass. Beautiful and functional. Measurements are etched into the ruler. Large engraving area. Whether you are looking for engraved gifts for men, retirees, the local PTA, theater groups, charities, or custom engraved gifts for your company, you are sure to find the perfect gift here at Engravables Plus. Our engraved gifts and awards can include an engraved logo at no extra charge. With a large selection of personalized gifts, you're sure to find the perfect gift for the athletes at your school. Engravable keychains are a great way to reward graduating seniors. Thank your Maid of Honor or any of your bridesmaids for standing by your side on your wedding day with our selection of jewelry boxes. They'll make the perfect personalized and engraved gift for her to cherish forever. Award someone's milestone- big or small- to show your appreciation for their efforts. Engraving awards and gifts is our specialty. Choose from plaques, clocks, or ballpoint pens to show your gratitude. Have the freedom to personalize any award of gift that you choose. Reward the book lover in your life with a personalized bookmark to hold their place for them when they decide to put their book down. You're guaranteed to find a great price whether you order one or one hundred. We offer free engraving on all of our awards and gifts, and free shipping is included on all orders over $99. We are confident the recipient of an engraved award from Engravables Plus will be thrilled with their personalized gift. With our attention to detail, discounted pricing and free engraving we appeal to sports teams, schools, churches, other organizations and companies. Feel free to give us a call with any questions. We'd love to help you select and design your perfect personalized gifts and awards.